As described in McCurdy and Stewart (2005), coarse woody debris (CWD) is defined as dead wood larger than 7.5 cm in diameter and laying horizontally at 45 degrees or less. It is measured using line transect sampling to estimate volume (m3/ha). Snags are dead trees larger than 7.5 cm in diameter at breast height (1.3 m) and standing at 45 degrees or more. They are measured using prism point sampling to estimate density (#/ha) and basal area (m2/ha). Dead wood is a key component of forest ecosystems underpinning many natural cycles and supporting a large proportion of forest biodiversity (Freedman et al. 1996; Evans and Kelty 2010). Dead wood levels are naturally dynamic and fluctuate in response to species mix, stand age, disturbance history, site productivity and decay processes. In general, dead wood occurs at high levels following natural disturbance, declines into early maturity (due to decay), then slowly increases in quantity and size as stands transition to old growth through stem exclusion and gap disturbance processes (Evans and Kelty 2010). A summary of CWD and snag data collected from 1,448 FEC plots are presented below (Tables 3 to 16). 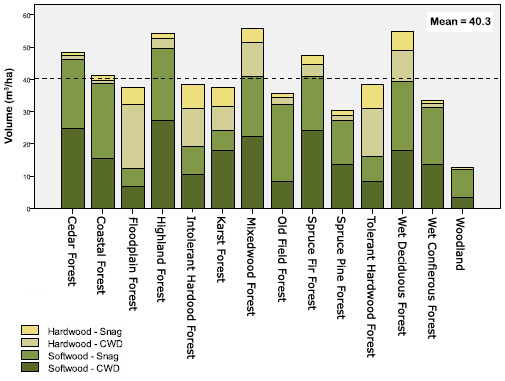 Data are reported by type (softwood and hardwood) and diameter class, variables which are correlated with wildlife habitat use and long-term nutrient supply. Large diameter dead wood is most valuable, persisting longer and providing habitat for a greater number of species (Evans and Kelty 2010). In addition, a diameter to volume regression was used to convert snag density to snag volume to allow reporting of total dead wood volume (CWD + Snag) for each forest group (Figure 8). See Appendix F for details of this regression analysis. Coarse woody debris volumes were calculated for decay classes 1 through 4 only using Equation 5 in McCurdy and Stewart (2005). Volume estimates do not include corrections for line slope and debris tilt. Dead wood summaries are not based on random sampling and therefore cannot be claimed as being statistically representative of dead wood volumes in mature stands in Nova Scotia. Overall values are, however, consistent with those reported for mature age classes from provincial inventory plots (Townsend 2004). Users should exercise caution when interpreting forest group dead wood data. Reported totals in Tables 3 to 16 may not equal class sums due to rounding.